Our team at SELECT Products Limited spends a lot of time talking hinges. We’ve been making high-quality, architectural-grade aluminum geared continuous hinges for new construction and retrofit applications since 1990. More than a million SELECT hinges are hard at work on schools, hospitals, hotels, offices, airports, stadiums, storefronts and other commercial and industrial buildings around the country. As a result, we’ve seen a lot when it comes to entrances. Lots of products, lots of repairs, lots of different ways to solve entrance problems. We’re here to share what we’ve seen, what we’ve learned and what you can do to save money, reduce repairs and make your building entrances more durable and more environmentally friendly. But the door swings both ways. We’d also love you to share and help others with your insights. Stephen focuses on the new construction market, and shares his knowledge of hinges and construction through presentations and hands-on training. He also shows why continuous hinges work best for high-traffic doors when he attends trade shows and major building materials and maintenance shows across the country. Over the past 12 years, Stephen has gained experience as a vice-president and regional sales manager for several companies in the building industry. In more than 10 years with SELECT, Bob has become an expert in its hinges, their capabilities and benefits. Bob not only serves as the face of SELECT at industry trade shows, but he also attends all major building materials, facility and maintenance shows to keep up with the latest industry news — from glass to locks to doors. 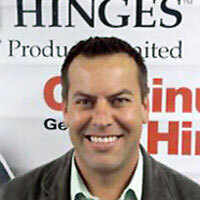 He is responsible for SELECT’s sales representatives and staying in touch with distributors and end users. 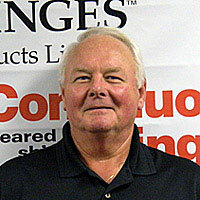 Over his 40-year career, Bob has also served as a sales representative and national sales manager for several manufacturers. 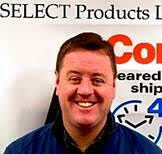 Aaron assists SELECT’s independent sales representatives in the eastern half of the United States. His 20 years of experience in business-to-business outside sales/management (five years in the construction industry) provide a fresh approach and depth to his market presentations and training sessions. Using his degree from Western Michigan University, Kalamazoo, Michigan, Aaron helps strengthen communications between reps and customers so they get the best, long-term solutions for their entrance needs.